TechPowerUp reports Prolimatech has introduced a blue edition of its Megahalems Rev. 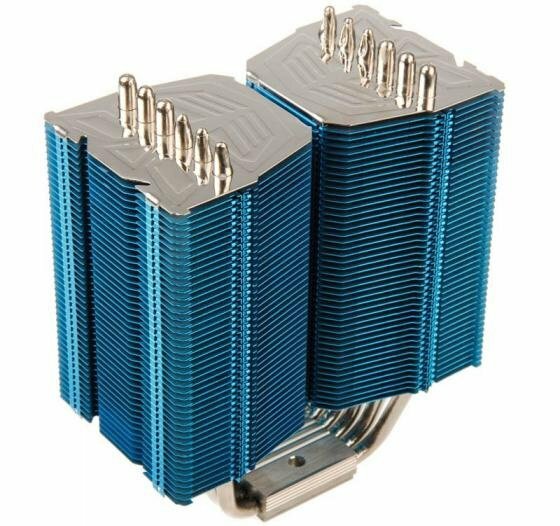 B CPU cooler. The cooler has the same specifications as the original model, but will likely cost a little bit more than the original's $70 price tag. This is almost exactly the same shade of blue as the one Gigabyte uses on its motherboards. Most of the cooler's 88 stainless steel fins are blue, with the top fins on each of the two stacks retaining a chrome finish. The six 6 mm-thick heat pipes passing through them are made of nickel-plated copper, while most metal parts of the retention modules are colored black.